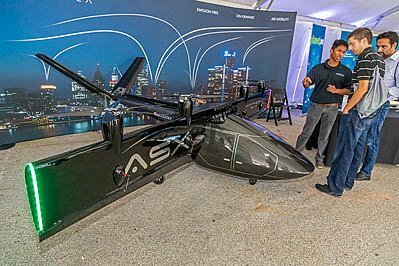 Detroit, Michigan - A model of an electric vertical take-off and landing autonomous airplane on display at the Detroit Moves Mobility Festival. The aircraft is being developed by Airspace Experience Technologies. Image Description: Detroit, Michigan - A model of an electric vertical take-off and landing autonomous airplane on display at the Detroit Moves Mobility Festival. The aircraft is being developed by Airspace Experience Technologies.